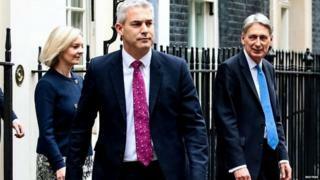 Stephen Barclay has become Theresa May's surprise choice to become the third Brexit Secretary in the past six months. But who is he? The 46-year old takes over from Dominic Raab, who quit on Thursday saying he could not support the prime minister's draft agreement with the EU. Mr Barclay has, for the past year, been a minister of state in the health and social care department, the rank below cabinet level. He voted Leave at the 2016 Brexit referendum, tweeting in February 2016 that David Cameron's attempt to renegotiate the UK's membership "did not deliver the game changer we need to protect against further EU integration". Despite being regarded for some time as a rising star, the MP for North East Cambridgeshire's appointment to such a high profile role counts as a major promotion. However, it appears that he may not have been the PM's first choice, amid reports that at least two cabinet ministers, Environment Secretary Michael Gove and Attorney General Geoffrey Cox, turned down the role. And the job has essentially been downgraded to focus on domestic preparations for the UK's departure, with Theresa May personally assuming responsibility for the remaining negotiations with the EU. A former banking executive who worked for Barclays - no relation - Mr Barclay is described by Parliament-watchers as a "smart, numerate, technocrat". He is also a loyalist, having not rebelled against the party whip during his eight years in Parliament. After taking the safe Cambridgeshire seat in 2010, he served on the influential Public Accounts Committee, which oversees government spending and is seen as a proving ground for political talent, for four years before a spell in the whip's office. In the summer of 2017, he moved to the Treasury, serving as economic secretary, or city minister, under chancellor Philip Hammond before taking on his current role in January. Fellow Tory MP Vicky Ford told the BBC's PM programme Mr Barclay was known for listening "very, very hard and getting things done". She said Mr Barclay's diverse constituency, consisting of rural areas around Wisbech that had seen high levels of EU migration but also the more prosperous commuter belt serving Cambridge, gave him an insight into both the economic benefits and costs of EU membership. The son of a trade union official and civil servant, Mr Barclay was educated at King Edward VII School in Lytham St. Annes and Peterhouse, Cambridge before qualifying as a solicitor in 1998. During his time in the City, he worked as an insurance company lawyer for Axa Insurance, as a regulator for the Financial Services Authority, and as Director of Regulatory Affairs and then Head of Anti-Money Laundering and Sanctions at Barclays retail bank. Mr Barclay, who is said to be a close friend of Theresa May's chief of staff Gavin Barwell, is married and has two children.